Modern development consisting of just over thirty properties. The property was featured in the November 2007 Spanish Homes Magazine it is furnished to a high standard including washing machine dishwasher etc. It is situated on Alenda golf course with stunning views towards the mountains surrounding Alicante. There are ample terraced areas around the property for both eating and sunbathing which overlook the pool and gardens. 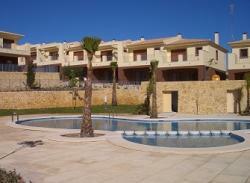 The area has superb golfing and easy access to beaches along the Costa Blanca coastline. Alicante city is a ten minute drive where there are numerous traditional Spanish bars and restaurants including 5 star cuisine at the Amergio hotel or the renowned Nou Manolin. The city is overlooked by Santa Barbara castle with the picturesque marina surrounded by further bars and restaurants. The Costa Blanca (White Coast) starts at Valencia, Spains third largest relatively unexplored city by tourists, and continues South towards Alicante. The route South is interspersed with fishing harbours and holiday resorts which, until you reach Denia are known chiefly to Spanish and other Northern European tourists. However from Denia down to beyond Alicante you will find many towns some with character and style and others not so sophisticated. You will pass through and maybe linger a while in towns like Javea, Moraira, Calpe, Altea, Albir and Benidorm, one of the worlds leading tourists resorts. Benidorm’s success began in the 1960’s when this, once modest fishing village was transformed into an international holiday centre. Whilst all the unique differences which collectively go to make up Spain may not find universal attraction, most people become quickly endeared to a significant majority of them. This is particularly true on the Costa Blanca! Sea sun and beaches, but beaches are not everything, even though the Costa Blanca has some of the very best, with the longest stretching for as far as the eye can see. With its unique climate, described as being among the best in the World, this coast has something for everyone. Alicante city has a population of over 300,000 and combines both classic and modern societies, living in harmony. It offers business and pleasure, entertainment and education. It’s history reaches back to prehistoric times with remains being found here from the third century before Christ. Today Alicante is a first rate tourist centre thanks to its splendid beaches, excellent climate and well known facilities. Besides it’s golden beaches and impressive Paseo Maritimo, Alicante has a wealth of history to offer the visitor and has an impressive mountain-top castle. The city also has a range of 18th century manor houses, all worthy of a visit. When it comes to beaches, the Playa de San Juan is considered to be one of the finest in Spain. A broad beach, some 5km long that has all the facilities you would expect, from hotels, bars, restaurants and even an 18 hole golf course. There are three small coves, Palmera, Cantalares and Judios. They are difficult to access and therefore appropriate as nudist beaches. The small, sandy Almadraba beach and the well hidden Albufereta beach are ideal for watersports in safe surroundings. Further south is the Playa del Coco, next to the regional railway station. This beach connects to Playa del Postiguet, located close to the city centre, with an attractive promenade, flanked by palm trees. The last of the city’s beaches is Saladar, broad, sandy and open. The pedestrian walkway here gives panoramic views of the bay of Alicante. Alicante is a cultural centre and has a varied selection of events and fiestas. At the end of June a traditional arts and crafts market is staged in Plaza de la Santisima Faz and nearby streets. The event has a medieval theme. During July and August the new esplanade in front of the port comes alive for the summer festival with constant theatrical performances and concerts. The fist ten days of December sees the International Puppet Festival that attracts people from all over the world – one of the finest events of it’s kind in the world. For more fiestas in Alicante. New supermarket and golf clubhouse within 5 minute walk from property.